British Indian Ocean Territory with its capital is located in Asia (archipelago in the Indian Ocean, south of India). It covers some 61 square kilometers (land area is about one-third the size of Washington, DC). English is the official language spoken by people in British Indian Ocean Territory. Thiscountry has no land-based border with any other country. British Indian Ocean Territory is unsurprisingly among the islands of the Indian Ocean, south of India, about halfway between Madagascar and Indonesia. The largest and most southerly of the islands, Diego Garcia, contains a joint UK-US naval support facility. All of the remaining islands are uninhabited. To reach someone British Indian Ocean Territory dial +246 prior to a number. The local cellular networks are operated on 900 MHz. Websites typically end with the top level domain ".io". If you want to bring electric appliances (e.g. battery chaarger), keep in min the local . The sign for the locally used currency Dollar is USD. 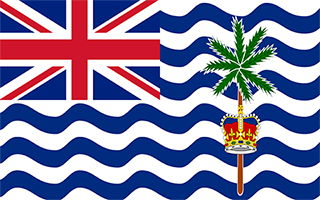 White with six blue wavy horizontal stripes; the flag of the UK is in the upper hoist-side quadrant; the striped section bears a palm tree and yellow crown (the symbols of the territory) centered on the outer half of the flag; the wavy stripes represent the Indian Ocean; although not officially described, the six blue stripes may stand for the six main atolls of the archipelago. Formerly administered as part of the British Crown Colony of Mauritius, the British Indian Ocean Territory (BIOT) was established as an overseas territory of the UK in 1965. A number of the islands of the territory were later transferred to the Seychelles when it attained independence in 1976. Subsequently, BIOT has consisted only of the six main island groups comprising the Chagos Archipelago. Only Diego Garcia, the largest and most southerly of the islands, is inhabited. It contains a joint UK-US naval support facility and hosts one of four dedicated ground antennas (the others are on Ascension (Saint Helena, Ascension, and Tristan da Cunha), Kwajalein (Marshall Islands), and at Cape Canaveral, Florida (US)) that assist in the operation of the Global Positioning System (GPS) navigation system. The US Air Force also operates a telescope array on Diego Garcia as part of the Ground-Based Electro-Optical Deep Space Surveillance System (GEODSS) for tracking orbital debris, which can be a hazard to spacecraft and astronauts. Between 1967 and 1973, former agricultural workers, earlier residents in the islands, were relocated primarily to Mauritius, but also to the Seychelles. Negotiations between 1971 and 1982 resulted in the establishment of a trust fund by the British Government as compensation for the displaced islanders, known as Chagossians. Beginning in 1998, the islanders pursued a series of lawsuits against the British Government seeking further compensation and the right to return to the territory. In 2006 and 2007, British court rulings invalidated the immigration policies contained in the 2004 BIOT Constitution Order that had excluded the islanders from the archipelago, but upheld the special military status of Diego Garcia. In 2008, the House of Lords, as the final court of appeal in the UK, ruled in favor of the British Government by overturning the lower court rulings and finding no right of return for the Chagossians. In March 2015, the Permanent Court of Arbitration unanimously held that the marine protected area (MPA) that the UK declared around the Chagos Archipelago in April 2010 was in violation of the UN Convention on the Law of the Sea.